For those who love historic action films from Spartacus to Gladiator and 300, Centurion is a wonderful addition to a genre that gets better with time as special effects technology advances to stunning heights. What Centurion does better than most historic films is maintaining a fair balance. The common inclination among moviemakers is to portray one side as the bad guys and the other as the good guys, making life simpler for viewers at the cost of making films that aren’t lifelike. In reality, as we know, both sides in any human conflict—from major political conflicts to religious, business and personal conflicts—are convinced of their own moral high ground. Centurion takes an unusually brave approach by forgoing moral clarity. It walks a fine line between an honestly brutal portrayal of Rome as an expansionist, violent and oppressive empire, on the one hand, and the individual soldier’s personal struggle for honor, fierce loyalty to his comrades, and human yearning for survival, on the other hand. 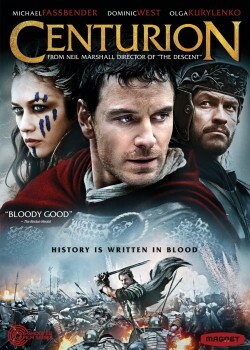 Michael Fassbender in the lead role as Centurion Quintus Dias manages to perform in a breathtaking spectrum of scenes, from superb fighting action to physical suffering to emotional and psychological ups and downs. In his own way, Centurion Dias redeems Roman evildoing by being such a fine person, who tries to do the right thing under terrible circumstances and against conflicting loyalties. Writer and Director Neil Marshall shows an uncanny ability to deliver almost non-stop violence in a series of cruel and bloody fights—most of which are face to face and murderously intimate—but do it all without either side making a clear case of good or bad. The invading Roman oppressors become the hunted underdogs, and the local rebels take on the inhuman methods of their foreign enemy—and even surpass it. The occasional voiceover of Centurion Dias telling his story gives the movie a personal tone of reflection, anchoring the disparate action scene in an underlying story of a man who is clearly decent and honorable. Supporting Fassbender/Centurion Dias as his fellow Roman soldiers are a capable group of actors, including Liam Cunningham and Noel Clarke. Imogen Poots does an excellent job as a castaway witch who lives in the woods and has no loyalties but to whom she choses (guess who…). But it is Olga Kurylenko, as Etain the mute, who is truly Centurion Dias’s nemesis—a role she performs with great skill. At times she is enchanting, at times frightening, and always she is spellbinding. Without a single line of dialogue, Kurylenko dominates the screen not only with her bursts of violence and deadly capable fighting, but with her body language, facial expressions, and mannerism. It is fair to say that Kurylenko’s eyes speak louder and clearer than the words of many of the other characters. And with a few facts sprinkled here and there by other characters, Marshall gives us enough information to understand why Etain does what she does and why it’s justified. Special mention goes to the film’s cinematography, by Sam McCurdy as director of photography, which takes us from the expected—ancient England in harsh winter (or is it their summer—who can tell?) with wide vistas of a beautiful landscape to the minute details of primitive life of that harsh time. The visual experience is intense to the point of enabling the viewers to feel the cold, smell the stench, and touch the roughness of both garments and skin. Ilan Eshkeri composed the music, which ties it all together at a quality rarely heard by moviegoers, lifting us to emotional highs and sinking us to desperate lows along this journey of courage, cruelty, and the extremes of human frailty and strength. In summary, Centurion delivers a classic historic film with all components working together like clockwork. It is an entertaining and often surprising action story with an excellent cast and a well-deserved (and well-executed) climax, topped by an unexpected yet logical twist at the end—which begets a satisfying resolution for the unquestionable hero, Centurion Dias. Highly recommended!